This summer, KMT Waterjet Systems launches a new series of high pressure pumps for waterjet cutting – the STREAMLINE SL-VI. The new pump models are based on four frames in different sizes and grant KMT customers a wide range of configuration possibilities. The SL-VI series offers various pressure ranges, motorizations and configuration features so that every pump can be tailored to the application it is needed for. The new high pressure pump series STREAMLINE SL-VI offers a broad range of configuration possibilities so that every machine operator can get the right solution for their respective application. To configure the pump, KMT customers can choose from different pressure ranges and motorizations, and they have a choice of various features to optimize the pump according to their particular demand. 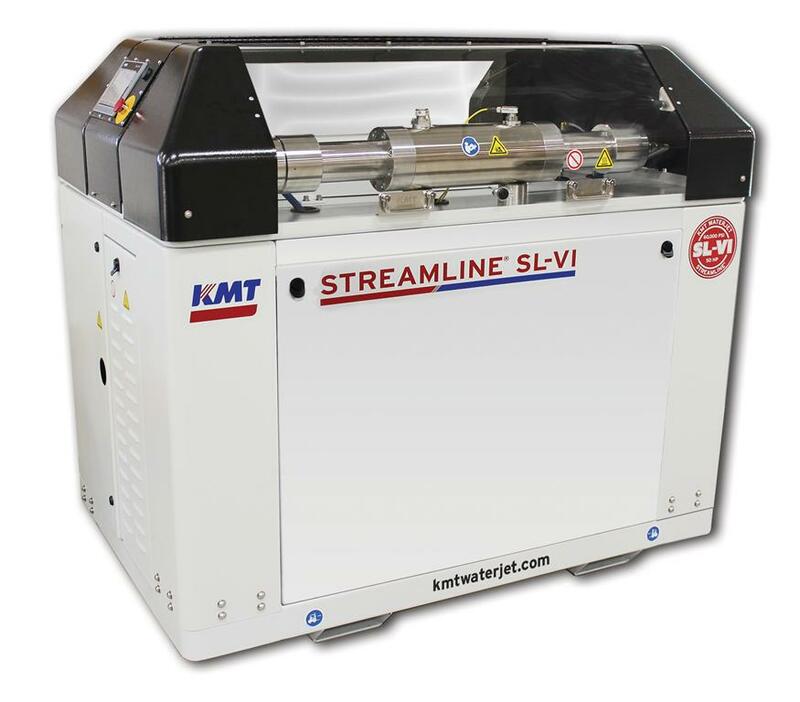 KMT offers the STREAMLINE SL-VI pump at three pressure levels. 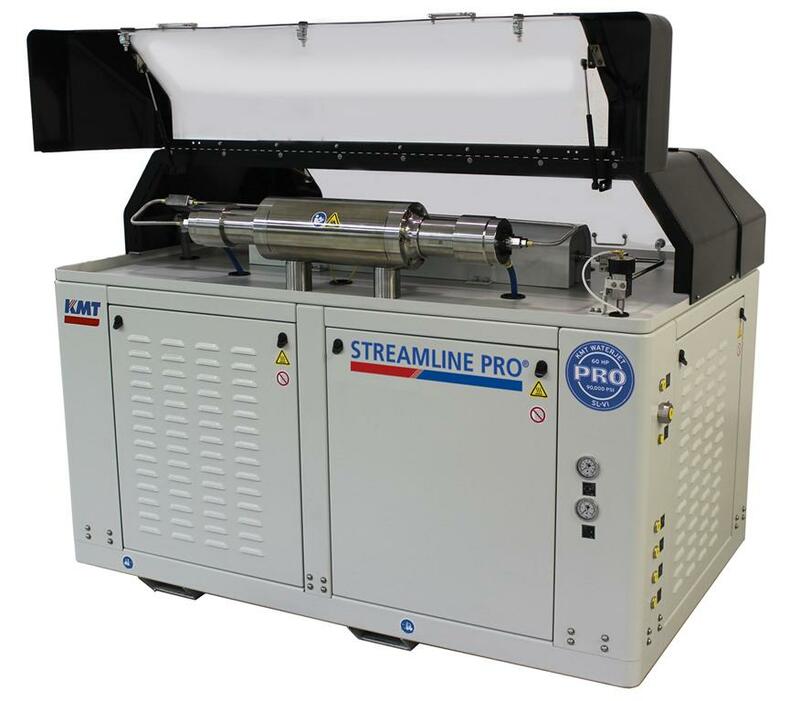 The PRO intensifier enables waterjet cutting at 6,200 bar for maximum performance. The model type PLUS operates at a pressure level of 4,100 bar, and the type STD allows for a maximum pressure of 3,800 bar. The STREAMLINE SL-VI high pressure pump will be available with motor ratings from 15 to 200 HP (11 to 149 kW). The different configuration possibilities range from a model without electrical cabinet, doors and cover for complete integration into the centralized control unit of an entire turnkey system to basic stand-alone machines for occasional cutting needs to fully equipped pumps which enable the most demanding cutting applications. The motor of the new high pressure pump series has been upgraded to IE3 according to the norm EC 640/2009 so the KMT Waterjet engineers were able to optimize the motor performance concerning motor efficiency and electrical consumption. This of course increases the flow rate and with it the maximum orifice size – a fact which allows for higher productivity: For example, the maximum possible orifice size for a 50 HP pump operating at 4,100 bar could be increased from 0.013” to 0.014” (0.33 to 0.35 mm). Furthermore, KMT has globally harmonized the PLC and HMI platform used for the control of the intensifier pumps. This is especially beneficial for KMT’s business partners which operate internationally: With the SL-VI pump model, all KMT high pressure pumps worldwide will be equipped with the same controls using the same operating pattern. The new controls feature 11 operating languages, soft start to optimize the power consumption as well as a network cable and USB port next to the display. As an option, KMT offers the Stroke Control system for load balancing of multiple high pressure pumps feeding into a common network. For technical data and further details see here. Starting with the high pressure pump series STREAMLINE SL-V, KMT introduced the Hard Seal End Cap (HSEC) intensifier. 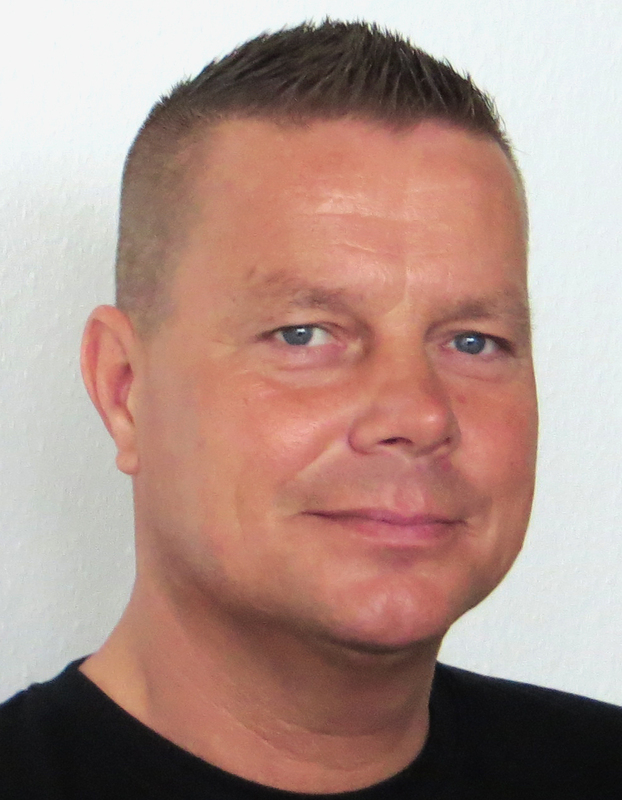 Compared to the previously used Soft Seal End Cap (SSEC) Design, this technology goes without synthetic seals – a modification which grants the machine operator several advantages, not the least being an increased uptime of the waterjet cutting system. To be able to benefit from this technology, KMT offers owners of the predecessor model STREAMLINE SL-IV an upgrade to retrofit their SSEC intensifiers to the HSEC Design. KMT’s HSEC design for intensifier pumps provides a metal-to-metal seal at the cylinder nut / seal head connection in the high pressure water bearing part of the intensifier. This layout eliminates a set of synthetic seals thus reducing consumables and maintenance as well as saving operating costs while simultaneously increasing the uptime of the connected waterjet cutting system. The HSEC Design is used in all pumps starting with the STREAMLINE SL-V series. It includes a large version (intensification ratio 23:1) for high pressure pumps with 100 HP and more as well as a small version (intensification ratio 20:1) for 50 HP pumps. In their effort to always provide their customers with the next technology level, KMT offers owners of pumps of the model type STREAMLINE SL-IV an upgrade which enables them to retrofit their pumps. Therefore, machine operators can benefit from the advanced technology without having to purchase an all new high pressure pump. For further details, customers can contact their waterjet cutting system provider or KMT directly.